Whether you're renovating your kitchen, hanging stuff on the walls, or working on a construction site, having access to a cordless drill set is a must. Cordless drills can handle various tasks, including driving and removing screws and drilling holes in the walls. 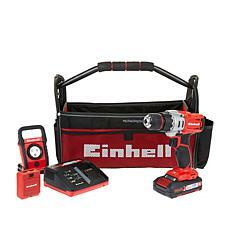 Every homeowner and DIYer need a high-quality cordless drill set, which you can find at HSN. These options are from top brands in the power tool industry, delivering impressive performance and the extra components you need. Choose from simpler cordless drill sets with a handful of bits or larger sets with up to 89 pieces. Handheld cordless power drills can also hold a charge for an extended period, making it easy to knock out all your tasks without having to stop to plug into the wall. If you need more power, check out the impact drivers and specialty drills available. It's also important to make sure you're using the right drill bit for your project, as using the wrong one causes your drill to work harder. With a variety of tools and tool sets, it's easy to find exactly what you need for your next project at HSN.